Increase engagement, deliver better customer service, reduce costs and increase revenue. Customer Success doesn&apos;t have to be a collection of disparate apps and data sources that make it hard to see what&apos;s happening. Magentrix Customer Community provides a complete integrated solution so that everyone contributing to Customer Success can collaborate easily. Whether it&apos;s private messaging, group discussions or multiple conversations, Magentrix makes it easy for everyone to stay engaged and productive. With pre-configured CRM integration Magentrix gives you all the tools you need for quick and easy setup. No custom coding required. You have the flexibility to build custom apps, tabs, layouts and views along with full control over access and security roles. Responsive design makes your branded customer portal look great on any device and Custom Themes provide that consistent brand experience and identity that your customers trust. Magentrix Communities redefine collaboration by connecting communication, engagement, learning and analytics in one secure place. It&apos;s more than just messaging. Magentrix Collaboration brings familiar tools for real-time communication to every aspect of Customer Success. Whether it&apos;s a data record, a document or file, or a content article, Magentrix lets your Customer Success Team communicate with each other and proactively engage customers in context. No more searching through endless emails to find something, It&apos;s right at their fingertips in the conversation! A Collaborative platform for Customer Success provides an excellent return on investment. By increasing efficiencies, reducing costs and reducing barriers to revenue growth, a Magentrix solution has a big impact on your Customer Success program. Bringing more employees together to ensure customer success requires collaboration and visibility but it also increases productivity. Enabling more collaboration between the Customer Success team and better engagement and communication with customers has a positive impact on revenue. More than two-thirds (67%) of customers expect self service options so offering this in your customer community has a big impact on how your employees spend their time. But improved communication and collaboration with social tools can also raise their productivity by 20 - 25%. For a sample company with 50 employees, this could save up to $250,000 over a year. Another impact on revenue comes from the ability to improve upsell and additional revenue from referrals. Increasing engagement and customer satisfaction encourages opportunities for more licenses or features from existing customers. And this comes at a much lower cost (6X) than generating revenue from new customers. If 25% of new revenue came from existing customers in our sample company, that could represent a savings of $93,000. A cloud-based Customer Success Community subscription might be about $15,000 annually. Implementations costs including customizations and support could come in at just under $15,000. When you add in the cost of an administrator, your total first-year investment might be about $89,000. *Based on a sample company with 500 customers, 50 employees, MRR of $300 and a churn of 5%. Magentrix Customer Community enables your Customer Success Program to improve collaboration, increase productivity and grow revenue. It&apos;s much more than just the standard customer support features. It&apos;s one integrated and seamless environment for your Customer Community. Delight your customers while simultaneously reducing emails and phone calls with a complete self-service community solution. Give customers the autonomy to help themselves, get support, access resources, and create a community where they can help each other while your success team gets visibility into all the interactions to drive customer success. Enable every department to stay on top of customer status, communicate with each other and customers in a familiar and secure collaborative environment. Magentrix Collaboration is the go-to source for engaging with your company. When the community has easy ways to communicate with company employees and other customers, it drives continued engagement. Self-service communities help to reduce costs in many ways such as providing searchable solutions to issues and reducing case volume. But Magentrix Customer Community also connects your team with customers when they need it. Improve customer satisfaction, increase productivity, reduce churn and grow revenue from existing customers. Collaboration is at the heart of your Magentrix Customer Community. Using familiar social tools your Customer Success team can work together with real-time and asynchronous messaging in context. Engage customers using the same tools for a truly vibrant community. Let customers engage with each other and your service reps in online community forums. Creates a social platform where your user community can effectively communicate with each other and you to get help and resolve issues. Customers are a great source of information, especially when they collaborate to come up with ideas and feedback. Ideas is easy to configure so you can keep track of what matters to your customers as they share, review and vote. Provide better support at a faster speed through help desk features and tools. Integrate with the knowledge base to provide self-service on many issues. For complex issues, customers can submit Help Tickets and open cases that your support staff can quickly access, update, and resolve. Communication and information are vital to customer success. 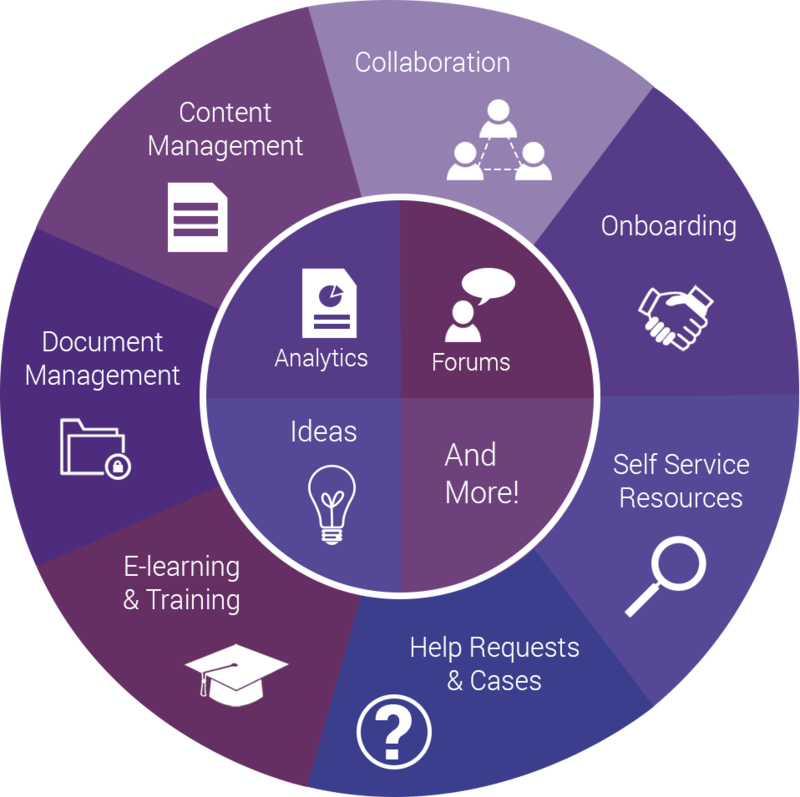 Magentrix gives you flexible content management tools for creating and publishing a wide variety of content to engage customers, communicate important announcements and provide searchable resources such as knowledge bases. Provide your customers with better service and support by storing all documentation, files and video in one secure, mobile-friendly location. Manage sharing options and document versioning to insure your customers find what they need, when they need it. Communication and information are vital to customer success. Magentrix gives you flexible content management tools for creating and publishing a wide variety of content to engage customers and communicate important announcements, information and articles. Accelerate product training with a fully integrated eLearning environment that provides onboarding courses, lessons, quizzes and certifications. Flexible testing for skills assessment and automatically certify to validate. Complete with user management and reporting to track progress. Customer success teams proactively drive customer success initiatives when the data and insights are available whenever it&apos;s needed. Gain visibility into your most important customer challenges with the Reports and Dashboard Builder features.